Bio: Hi! My name is Peanut (#2370) and I am very special. 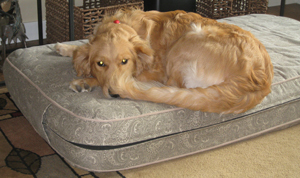 I am a very petite nine-month-old Golden Retriever. Though I am not very big, only 36 pounds, I am very smart and just love people; I also love toys and bones. Things did not start out very well for me but since I have been in my foster home, life is great. I have very unique front legs that don’t really bother me very much but you will want to know more about that. But let’s get back to my sterling qualities. I learn very quickly and know several commands like “down”, “sit”, “kennel”, “wait”, “go around” and “get ready”. I would love to learn a lot more and go to school. I am also very cute and because I am not too big I could sleep on your lap, if you would let me. 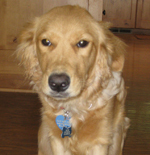 I get along well with other dogs, though I can be a bit pushy because I’m young. I’m not familiar with cats and children. I have excellent house manners and happily come when called. Did I mention I am very cute? Peanut has a significant deformity of her front legs. If you look closely, you’ll notice that her front legs from the wrist down appear to be bent at an exaggerated angle. Peanut’s ulnas were fixed and had stopped growing, though the radii have not. This has caused the radii to curve outward. Dr. Munjar, Peanut's vet, gave us four options: 1) euthanize now; 2) leave her as is and she’ll probably live another year, then will need to be euthanized; 3) cut the ulnas to see if the radii will straighten some on their own; or 4) rebuild the legs. Because of the cost, pain and possibility of infection, GBR did not choose option 4. Neither could we euthanize her without giving her a fighting chance. We elected Option 3 – cutting the ulnas. On July 17th, Dr. Munjar did the surgery and Peanut has fully recovered and is doing very well. She had her final visit and x-rays with Dr. Munjar on August 29th. X-rays were taken, which showed there will still be more growth coming but not a lot since Peanut was about 7 months old. Since the ulnas were cut, both radii have in fact straightened some so there is less curve where it meets the ankle. This is excellent news! Dr. Munjar confirmed that he does not think that she has any pain and in fact still can have her 15 minute walks and play with the other dogs living in her foster home. However, if in the future she shows some pain due to deterioration of the ankles, she will need to have her ankles fused. She will still be able to walk, run and play but will have limited movement of her feet. This situation where the ulna stopped growing was probably not from trauma but genetic. 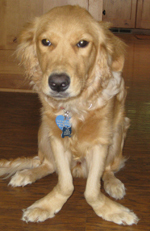 Her small size may be part of the deformity but is a big advantage for her, as there is less stress on her wrist joints than if she were a normal sized Golden. She will need to lead a relatively quiet life to extend the time her wrist joints are pain-free. Her walks are limited to 15 minutes twice a day and she gets a joint supplement and fish oil once a day. She could have a future as a therapy dog once she is a bit more mature. Her sunny disposition will brighten anyone’s day.